Priority: Obtain a general revenue appropriation for the 2020-2021 biennium to provide a targeted increase in the Medicaid reimbursement rate for free-standing, non-profit children’s hospitals. Background: The eight non-profit children’s hospitals that are CHAT members are estimated to lose $787 million in Medicaid funding in less than 10 years. These children’s hospitals serve children from across Texas and provide inpatient care to children from 242 of Texas’s 254 counties. Children’s hospitals offer highly complex and specialized care and are the safety net for children in Texas. 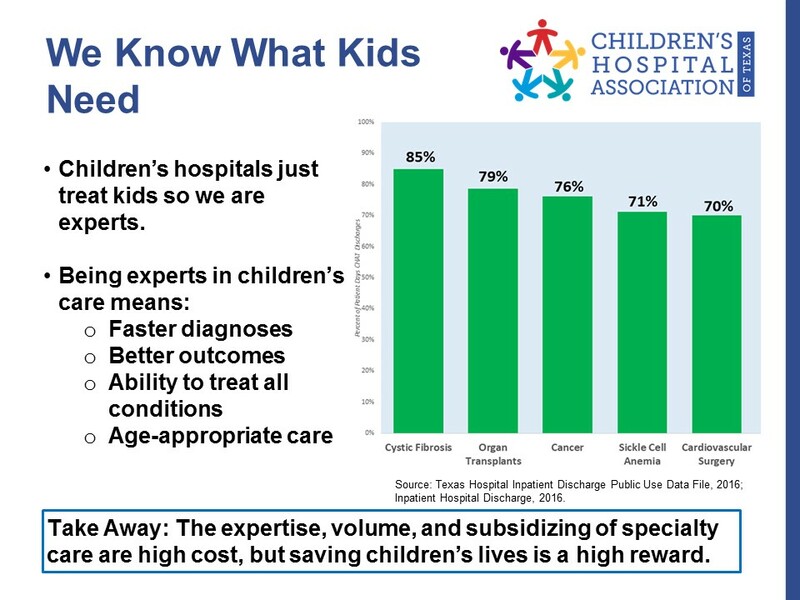 More than 40 percent of the care provided at children’s hospitals is for the most severe conditions, compared to 16 percent at all other Texas hospitals. Priority: Ensure that the Texas Health and Human Services Commission receives direction to prioritize pediatrics and pediatric providers in future uses of Medicaid Delivery System Reform Incentive Payment (DSRIP) program funds. 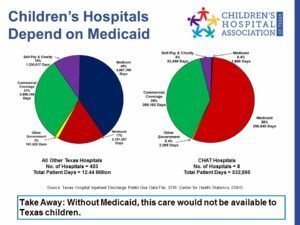 Background: More than 70 percent of Medicaid enrollees in Texas are children. Pediatric providers have had limited ability to participate in DSRIP because the projects were primarily focused on adult health. As the current DSRIP program will end in the next few years, the State and providers are seeking new ways to innovate with the DSRIP funding. Given the number of children in Medicaid, it is vital that those funds be directed to pediatric providers, especially children’s hospitals. Priority: Mitigate the adverse impact of the STAR Kids population on the Potentially Preventable Event (PPE) program. Background: STAR Kids is a Texas Medicaid managed care program for children and adults aged 20 and younger who have disabilities and require medically-complex care. The “potentially preventable events” program seeks to deter occurrences, such as readmission to the hospital, which may be preventable. However, children in the STAR Kids program are medically fragile and require frequent complex care. A hospital may be the only place these kids can get the care they need. While it may seem that a readmission is “preventable,” for this child, that readmission may be life-saving. Without adequate funding, children’s hospitals cannot continue to provide services that children – those who need an organ transplant or heart surgery, or need treatment to cerebral palsy or spina bifida – desperately need. Of the more than 7 million children in Texas, almost half – 3.5 million children – receive their health care through Medicaid or the Children’s Health Insurance Program (CHIP). 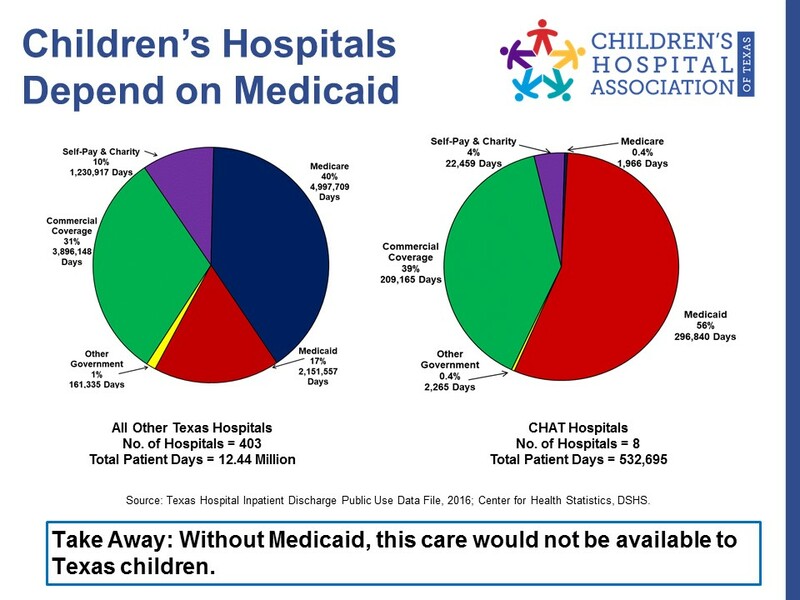 Because so many children in Texas are enrolled in Medicaid and CHIP, children’s hospitals are heavily dependent on these programs. As discussion of Medicaid reform occurs at both the federal and state levels, protecting Medicaid for children helps ensure that they get access to appropriate health care. Early detection and intervention are the best ways to help kids get off to a good start. Children enrolled in Medicaid are more likely to attend school, graduate from high school and go to college, becoming healthier adults who will earn more and pay more in taxes than those children who do not have appropriate health care. Investments in sound public health policies are the first line of defense against preventable injury, disease and disability and the resulting medical care costs. The leading cause of death for all teens in the United States is motor vehicle crashes. Drownings, accidental suffocations and child abuse continue to take a far too high toll on children. Texas and its local communities can reduce the loss of life, pain and suffering by improving injury prevention activities. Immunizations that protect children against the dangers of vaccine-preventable diseases are one of the great successes of the medical care and public health systems in Texas. Death and disability from diseases like smallpox, polio, mumps and whooping cough have been reduced dramatically because of immunizations. However, vaccine-preventable diseases are a continuing threat in Texas. Strong, continuing efforts to maintain high immunization rates among children and to improve adult immunization rates are essential. There is no risk-free exposure to smoke. Maternal exposure leads to higher rates of prematurity and childhood exposure results in higher rates of asthma and respiratory tract infections. Four out of five smokers start by age 18. Reducing exposure to secondhand smoke in all indoor workplaces will make a significant difference in the health of Texans and especially children. Sadly, human trafficking is among the most lucrative criminal enterprises in existence today. Trafficking can involve school-age youth, particularly those made vulnerable by challenging family situations, and it can take a variety of forms including forced labor, domestic servitude, and commercial sexual exploitation. All children should have health insurance that covers the comprehensive services that children need, from prevention to specialized care for the most complex problems, whether they are covered by public or private insurance. Children’s Hospitals Provide High Quality Pediatric Health Care. Children’s hospitals are the pediatric safety net for all Texas children and have unique services and expertise in the care of children. Children’s hospitals serve our state’s most ill children – specialized care that they cannot receive elsewhere for congenital heart conditions, neurosurgery, transplants, cancer and other serious conditions. Texas has one of the fastest-growing child populations in the country. To meet the needs of our children, it is critical to build the clinical facilities and programs needed to serve our children, from primary care to the most advanced specialty services. 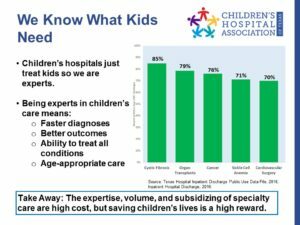 Children’s hospitals are recruiting and training doctors, nurses and other pediatric providers to meet the needs of children as well as conducting research to improve and advance the efficiency and effectiveness of medical care. State funding through Medicaid and CHIP as well as community support are essential to ensure that children’s hospitals can meet the growing needs and challenges in our state. Any child who needs the services available through a children’s hospital should be able to get that care.